Cut beef into 24 (3/4-inch) pieces. In medium bowl, mix beef, shrimp and teriyaki sauce. Sprinkle with pepper. Cover; refrigerate 30 minutes, stirring frequently. Meanwhile, soak skewers in water at least 30 minutes before using to prevent burning. Spray grill rack with cooking spray. Heat gas or charcoal grill. On each skewer, thread 1 beef piece, 1 shrimp and another beef piece, leaving space between each piece; reserve marinade. Place kabobs on grill. Cover grill; cook over medium heat 5 to 6 minutes, turning once and brushing with marinade once or twice, until shrimp are pink. Discard any remaining marinade. 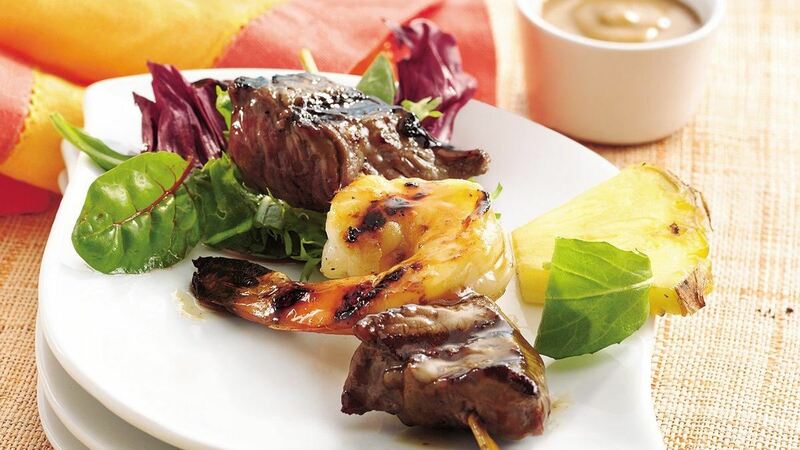 Kitchen Tips: Assemble these kabobs several hours ahead; cover and refrigerate them until you are ready to grill. These flavourful kabobs would be delicious served with a spicy peanut sauce.